Every year, around the middle of March, something strange, or rather bizarre and spectacular, happens in the Valencia region of eastern Spain. Giant characters appear in streets and plazas, alfresco parties and revellers appear and disappear as quickly as the vast amounts of beer they consume, with the people of the city taking on a party attitude like no other. 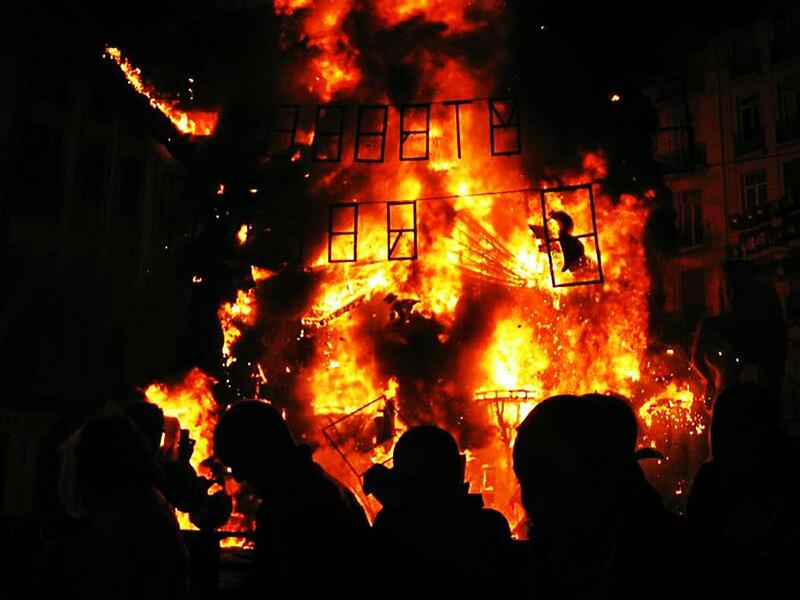 It's the loudest, most awe inspiring and significant fiesta, or festival in the whole of Spain and it's called Fallas. Fallas (pronounced fay-as) is the Valencia regions' most important fiesta and is officially a week long celebration, usually starting around the middle of March. However, as testament to the sheer amount of work that goes into each yearly spectacle, the whole process and planning takes a entire year! The day after the final day, the planning starts again for next year in earnest! 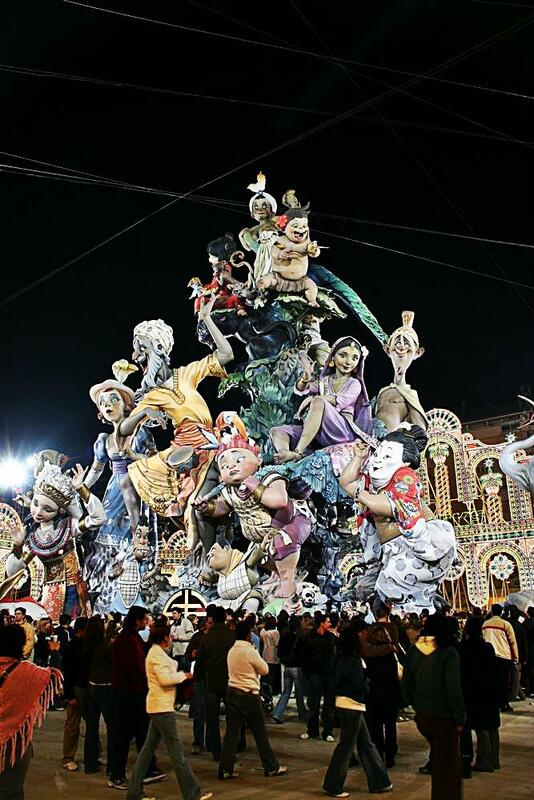 Fallas is an amazing spectacle that shows the best of Valencia, of Valencian culture and the general "we are going to party!" attitude of the people involved. 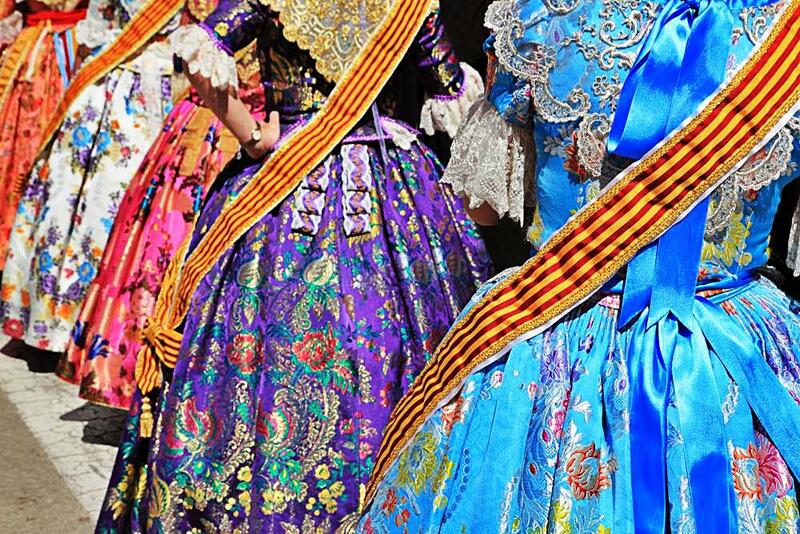 From the Falleras in their amazing dresses, plus accoutrements, all of which can run into thousands of euros, to the statues, or "Ninots" that appear each year, all aspects of the fiesta come together to make a show-stopping spectacle like no other, and best of all it's FREE to watch! How is this spectacle organised on such a grand scale? Each individual area (or "Barrio") of the city has it's own fiesta committee called a Casal. These clubs are normally funded by private subscriptions by each members families, plus very often local business will contribute too. Compared to other European states, this is by far "community spirit" in action, and everyone works together, making dresses and costumes, painting statues, collecting funds towards the week, organising activities for the members, in fact everyone has their part to play in organising their Fallas week. There is a fair amount of friendly competition between each area and each year the Mayoress of the city awards a grand prize for the winners, with other prizes of course for the runners up. The competition also extends to the people involved in setting up the Fallas themselves and of the Falleras, which are split into two main branches: Fallera mayor and Fallera Infantil, are themselves judged and awarded prizes. The parents of the Fallera Mayor (the elder of the two girls chosen) have a duty to fund the activities of the Casal during the actual week, so families of the chosen girls often have to dig deep, but the privilege that accompanies this stays with them for their entire life. 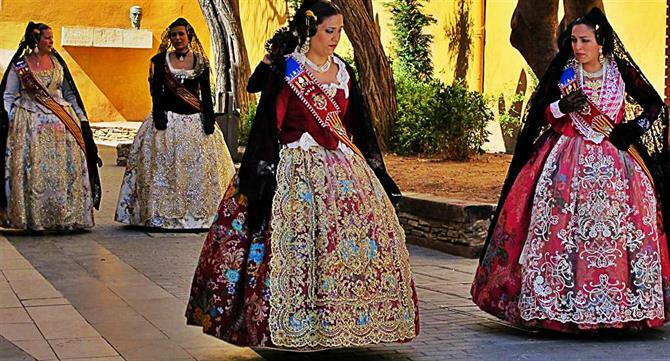 The beautiful dresses that the Falleras wear are mainly hand made by Casal members and the families of the Falleras. They are multi layered, very expensive and apparently not very comfortable to wear (!) but, their beauty and authenticity makes the ladies themselves quite a spectacle especially seeing them walking down the street or sat at a local bar! This pantomime scene is played out across the city and is heavily covered on the Local TV station, Canal 9. It is indeed an honour to be chosen to be a Fallera, and the title stays with the chosen one for life, bringing prestige and status to both the Fallera and their family. The men get a look-in too as Falleros, and wear a black smock and a "mocador" (a neckerchief in English) which was the traditional clothing for the workers in the rice fields of Albufera, however it is the women who steal the limelight and their clothing is complemented by elaborate spiral hair extensions at the side of the head, special earrings, hair clips and other beautiful jewellery. The women's outfit is never complete without their "Abanico", the hand held fan, some of which can actually cost several hundred euros and are made by top designers. Each area or district has it's own Ninot, often a huge sculpture in cartoon form, typically depicting and lampooning local or national politicians (and more recently bankers)! These fantastic sights are seen as a form of community based satire, reflecting whatever the population feels most strongly about, or the people in the public eye whom have had negative effects on the community or the economy. The current Spanish Prime Minister, Sñr. Mariano Rajoy and his administration are, of late, a popular subject. The statues take a year to make and a whole industry is dedicated to their design, fabrication, transportation and erection, and many of these huge constructions can cost in excess of 100,000 euros. 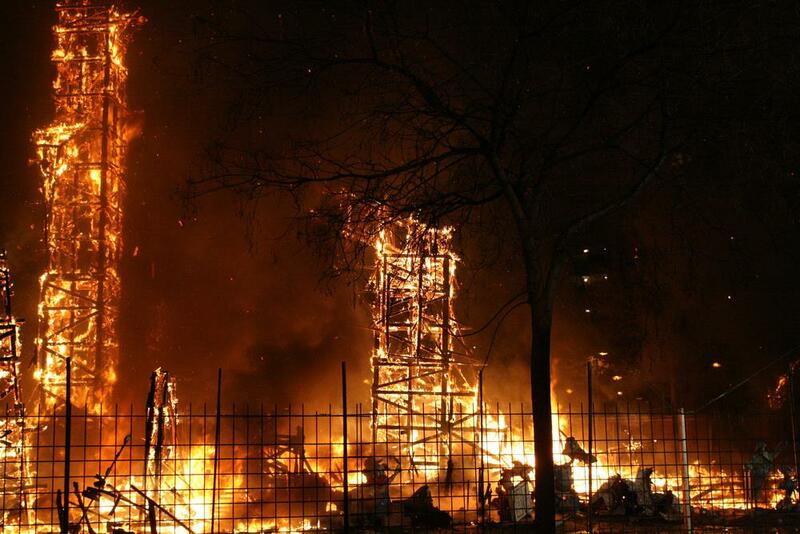 On the final night of the fiesta, at around midnight, these amazing and expensive statues are burnt down! 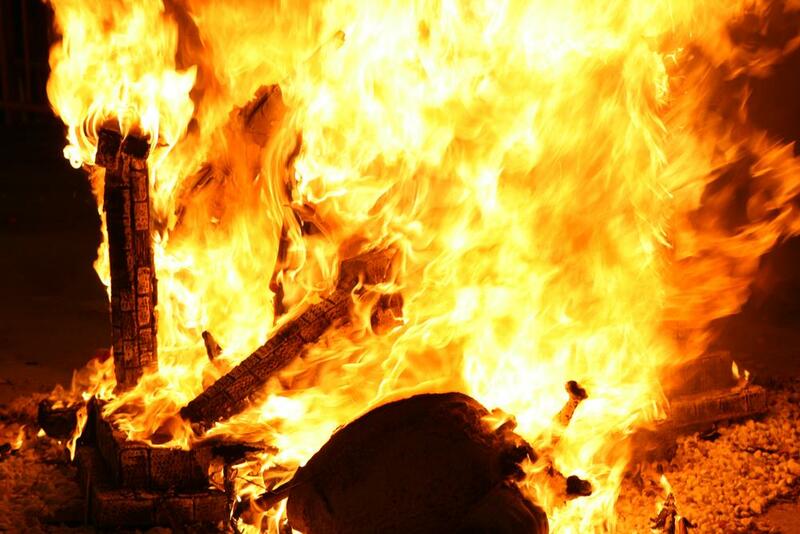 This is known as the "cremà" (the burning) and is followed by fireworks and a street party that goes on VERY late! 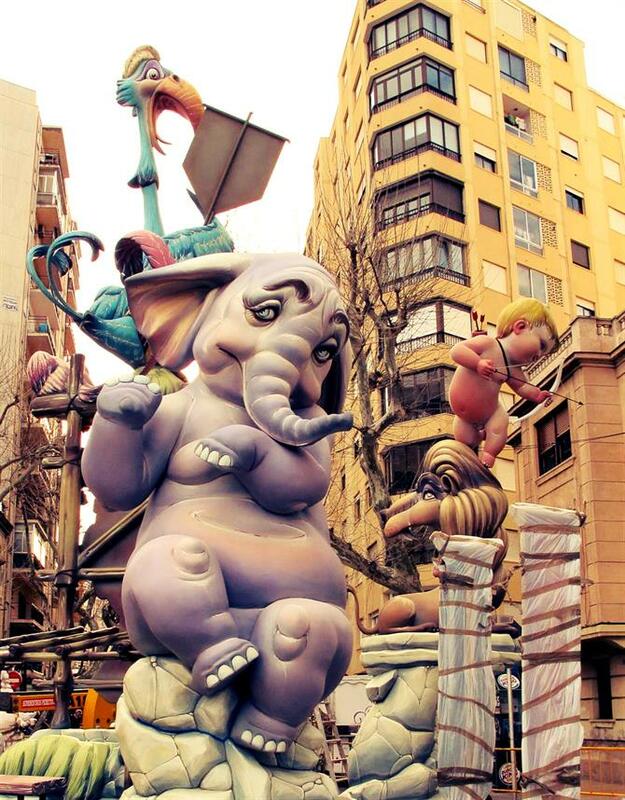 If you are staying in Valencia for Fallas week, do NOT expect to get much sleep. Valencia people are known "party animals" who come into their element during the Fallas week. Expect a LOT of drinking, eating and general merriment taking place across the week and an "anything goes" approach to life in general and health and safety too, so those with a weak heart or indeed ear problems, are not encouraged to visit during this time. Seriously. The noise never stops and fire crackers are thrown by children in every street, and for the duration of the week, a daily "Mascleta" fireworks display is held around 2pm each day in the "Plaza del Ayuntamiento" (Town Hall Square). This is often preceded by the traditional Fallas parade music called "El Fallero". The firework display takes place in an enclosed area, making each bang ten times as loud, as the bones in the body are shaken to their core with the loudest and most impressive firecracker display on earth. One that has revellers ears "ringing" for several days after. ...and after several late nights partying with Valencia's best, don't expect a nice lazy lie-in the next morning, as by 8am the first of many firecracker rounds are started up again, getting everyone out of bed. This is called the "Desperta" (or wake-up call) and from experience, is not a pleasant way to remind yourself of a hangover! Valencia during Fallas week is a spectacle like no other, and like nothing even the most intrepid, experienced and seasoned world traveller will ever have experienced unless they have been in a war zone at some point. 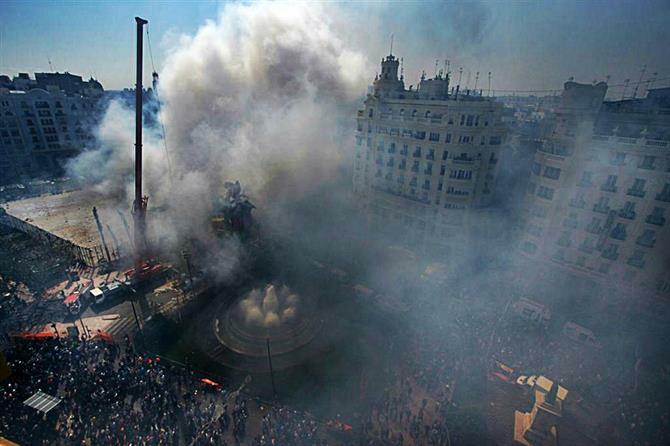 Due to the sheer intensity of the celebrations, and the throngs and crowds of the spectators, unless you actually specifically wish to experience Fallas only, the chance of other sightseeing in this historic and culturally rich city are slim during Fallas week, so a perfect excuse to come and stay in Valencia at another point in the year! If it all sounds a bit too hectic, the Fallas is also celebrated in a smaller but equally enthusiastic manner, in various towns up and down the coast. This is also the case in nearby towns and villages inland from Valencia too such as the ancient Roman town of Lliria for example plus, La Eliana, Chiva, Villamarxant, Montroy, Torrent, or up the coast in Castellon. Fallas is celebrated on a smaller scale in Benidorm and also in some of the Costa Blanca's more popular resorts so if you plan on staying in holiday accommodation in Denia for example, Fallas can still be experienced in a subtle way, but nothing on earth can compare to the show that is put on each year in Valencia city. 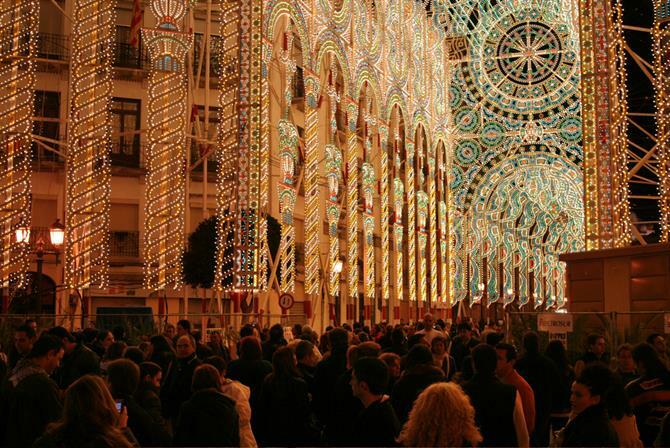 Valencia city during Fallas week is very busy indeed so to get in on all the action, it is recommended to rent an apartment in Valencia city where you can not only be in the thick of the action, the traveller will have access to 1000's of bars, restaurants and other points of interest, just don't expect to get much sleep! Valencia is an intriguing places that can surprise even the most seasoned traveller. Here are six things you probably didn't know about the city! Discover the sights, sounds and smells of Valencia's historic central market and take a day trip out into the centre of the city with us! Spain is world renowned for it's colourful and lively fiestas, but Valencia's Fallas festival is by far the loudest in Spain!